On Friday 5 April Bowral was the host club for the Bronze Shield round. Special thanks are due to a number of our members who made the day very successful. Helen Chadwick was our hostess for the day and arranged a magnificent morning tea for the visiting players. I have seen the photos!! Technical issues seem to be preventing me from showing them to you. Helen would particularly like to thank Carol Warner, Anne Keys, Rosemary Downing and her neighbour Anneke for their special contributions. Chris Hill was our successful team captain for the day - a 4 to 1 win over her old club Federal. Well done Chris and the rest of the team - Carol Warner, Pam Barker, Sue Flaxman and Anne Keys. The team made sure we stayed on top of our side of the table. Each host club must provide an official referee for the day. Thanks to Noela McMurray for taking on this responsibility and acting as the starter at the beginning and referee during the day. Our final pennants match of this home and away series is next Thursday at Federal Golf Club. The team to play Queanbeyan are Carol Warner, Chris Hill, Barbara Clayton, Pam Barker and Jane Clifford. The local branch of Legacy will be holding a meeting and lunch at the club on the 2nd Tuesday every month. As the kitchen will be open on these days to cater for these delegates, it also means that we will have access to a full menu after our golf on those days. Tim has also advised that due to a function that has been booked, full catering will also be available on Tuesday 16 April. 23 players contested this event in almost perfect conditions. This event was also a Veteran Women Golfer's Association of NSW event. The winner in each division will receive a VWGA Hat Clip. Nett results versus the daily DSR for each player are then compared to winners from other clubs around the state to compete for the Mabel McKenzie Brooch and voucher. We regularly receive notification of upcoming events at other clubs so make sure you check the locker room to see what is available. Any details for events being hosted by CSGA clubs are on clipboards on the bench under the notice board. The next one is the CSGA Veterans Stableford event at Goulburn on Monday 6 May. Always a special day. Details of events being held at other clubs are available in the folder on the same bench. Today 12 players travelled to Goulburn to play in the Autumn round of the Bowral Goulburn Shield. 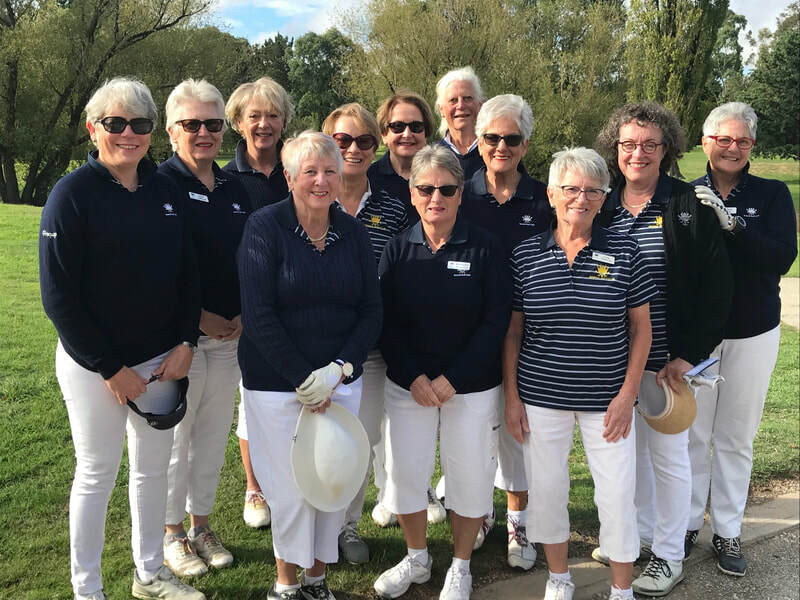 The team of Chris Hill, Barb Clayton, Pam Barker, Anne Geddes, Clare Stanham, Sue Flaxman, Jane Clifford, Helen Chadwick, Ruth Bailey, Rosemary Downing, Uschi Eriksson and Sharon Rowe were successful winning 8 to 4. Well done team! 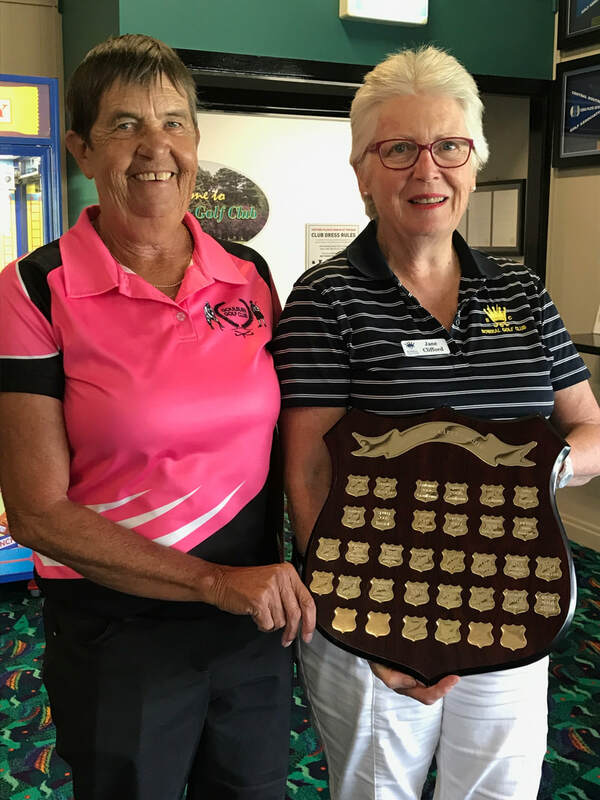 Here is the team before we teed off and me happily receiving the shield from Goulburn Captain Ann Ridley to bring back to its rightful place in the Bowral Club House. Chris Hill had the dubious honour of playing Hope Cohen as our number one player. Hope plays off 6 and even threw in a birdie to make it even harder for Chris. A valiant effort though Chris. Post the game though here are Hope and Chris showing off an interesting new outfit. Only Chris could come up with this! Considering all the rain we have had the course was in great condition thanks to Damian and his team. 25 players competed across 3 divisions with some great scores coming in. As you will remember the February medal was not decided on the day and today's round acted as the decider between Carol and Maggie McKenzie. Carol was the winner on the day so we were delighted to also present her with the February medal. As you are aware we have been concerned about the declining numbers of competitors in the 6 medal rounds we play during the year. In an attempt to increase player numbers, new Conditions of Play were introduced for the first two rounds this year. Play would be from two tees (Division 2 from 1 tee and Divisions 1 & 3) from the other. Tee allocation to alternate. One of the reasons for this was so that Division 3 players hit off a bit earlier (particularly in the hot weather) and the spread of times of players finishing was reduced. Hopefully more players would come in for lunch and presentations. Unfortunately these changes have not increased player numbers as hoped. At our Match Committee meeting last Thursday we considered the feedback we have received from many of our members. We are only a small club and want to ensure that the positive feelings amongst our members continue. From the next round the following changes will be made. All play will be from the first tee. Medals will still be presented in divisions but players may play with whomever they choose. Just make your online booking as per any normal golf day. Conditions of Play will be updated prior to the next round and will be posted on the web site and on the board in the locker room. 19 players on the day and again some great scores. D & P 12th hole - Carol Warner (holed for 2)!!! A good Saturday field of 13 players. Anne Geddes as Pennants Team Manager has achieved great results this year. As you know the team won at Goulburn by defeating the home side 3/2. The following week the team of Chris Hill, Pam Barker, Anne Geddes, Carole Byrnes and Helen Chadwick went even better. Playing at Queanbeyan the team defeated Royal Military College (RMC) 5/0. What a great result. 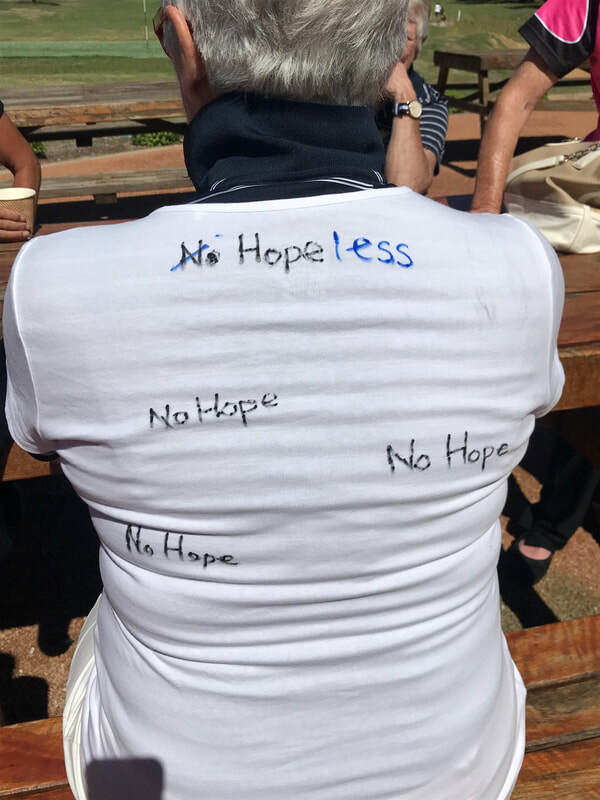 On Friday 29 March the team of Chris Hill, Barbara Clayton, Pam Barker, Jane Clifford and Anne Keys travelled to RMC to play Belconnen. Unfortunately we could not maintain the good form and lost 4/1. Chris Hill was our only winner. Next Friday (5 April) is Bowral's turn to host the Pennants matches. 30 players and 15-20 caddies will be here to play with the first matches at 09:20. Bowral will be playing against Federal. This will be followed by Belconnen vs Queanbeyan and then Goulburn vs RMC. Chris Hill will the Pennants Team Manager on the day. Noela McMurray will manage the sign in and distribution of cards to the Team Managers and act as starter. Noela will also be our official referee for the day ably assisted by Carol Humphreys. Helen Chadwick is our host for the day and will be arranging morning tea at the pro-shop for the visiting players and caddies. Any contributions such as a slice or cake that you can make to the morning tea will be gratefully accepted. Please let Helen know if you can help. 12 players will be travelling to Goulburn to compete in this hotly contested biannual event. The last time we played was in Bowral in the spring and the result was a tie. The team this year is Chris Hill, Barbara Clayton, Pam Barker, Anne Geddes, Clare Stanham, Sue Flaxman, Jane Clifford, Helen Chadwick, Ruth Bailey, Rosemary Downing, Uschi Eriksson & Sharon Rowe. Good luck team - I hope we can return the shield to its proper place on the wall in the Members room. The event went ahead with very little rain on the day, but VERY heavy conditions underfoot! 44 players played the Irish Stableford game, with 1 score counting on Par 3's, 2 scores on Par 4's and 3 on Par 5's. Twenty visitors came from Gold Creek (ACT), Goulburn, Moss Vale, Highlands, Mt Broughton and St. Michaels. NTP was won by Ellen Goodwin at 6th hole, and Di Lindsay and Leonie Poulton at 14th hole. Raffle winners was Michelle Miller (Gold Creek) and Judy McCarthy. Congratulations to all players for braving the wet course, but the warmth of coffee, lunch and good inter club friendships enjoyed in the club house afterwards, made it all worthwhile! Invitation Day is definitely on tomorrow, Thursday 21st March. We have been advised that CARTS WILL BE ALLOWED. Shotgun Start is at 9am, followed by Lunch and Presentations in the Clubhouse. Please advise you guests and playing partners if necessary. First Pennants Round - A Win!!! Today was the first round of our CSGA Bronze Shield Pennants season. Our team of Pam Barker, Carol Warner, Carole Byrnes, Chris Hill and Anne Geddes (team captain) travelled to Goulburn. The team had to play home side Goulburn and won 3/2. Well done to all of you. Don't forget there are still another 4 rounds to go so if you are available for any of the matches let Anne know. Here are some photos taken at the Anniversary Dinner on Saturday. Our President Barbara Clayton presented the Women's trophies on the night. The event is designed to recognise the BGC Champions (both men and women) before an appreciative audience. Michelle Di Natale was not able to attend our Opening Day event at the end of January. 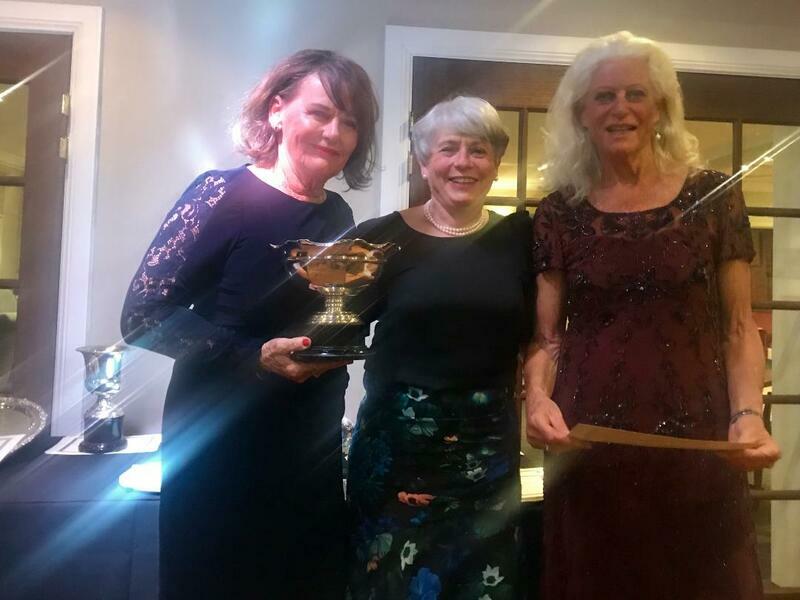 Here is Barbara presenting her with the Jean Derrin Trophy for the most reduced handicap in 2018. This is the second year in a row that Michelle has won this prestigious trophy. 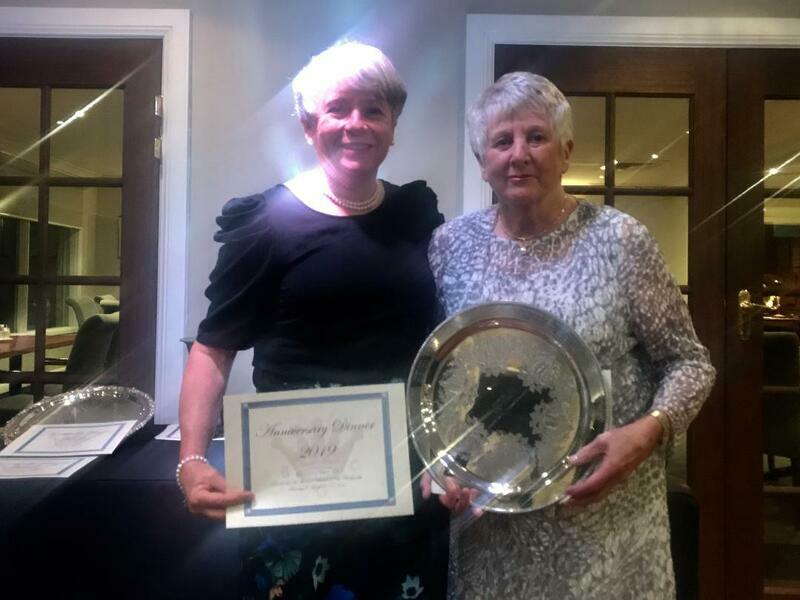 Our Club Champion Pam Barker receives her trophy from Barbara. 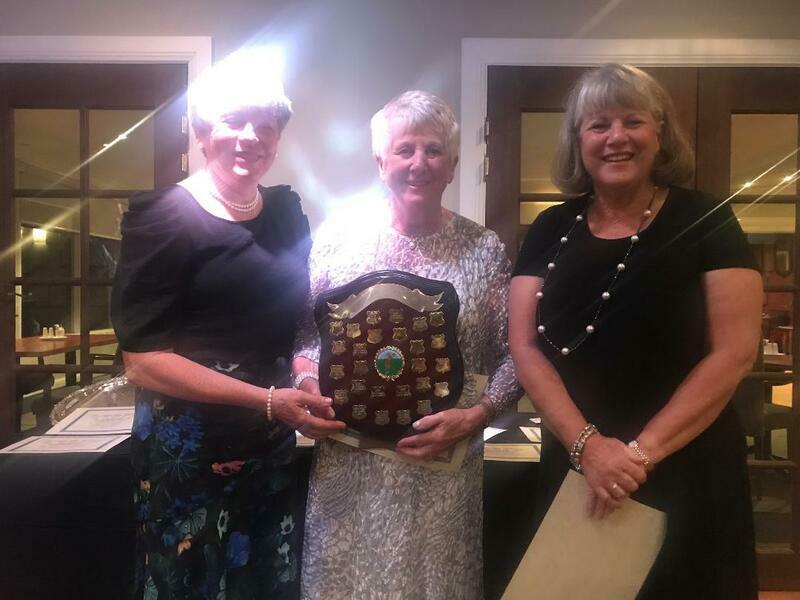 Other presentations on the night included: Pam Barker & Carol Warner (Foursomes Champions); Sue Harrison (Division 2 Champion) & Clare Stanham (Division 2 Runner-up) and Rosemary Downing (Division 3 Champion) & Uschi Eriksson (Division 3 Runner-up). The tee allocations have been loaded in the system. This should be a fun day. Bookings can still be made - please contact the pro-shop. Don't forget to put your names into the system. We will not be doing a draw - just make sure you book in the correct division. For this round Division 2 will be playing from the 1st tee and Divisions 1 & 3 from the 10th. Only 6 players braved the weather. It was wonderful to play in cooler conditions and reducing the game to 14 holes helped even more. Ruth Bailey, Uschi Eriksson & Jane Clifford with 34 points won from Pam Barker, Anne Geddes & Anne Vitou on 31 points. A very close result today with Anne Vitou (35) and Sue Flaxman (27) winning with 731/2 nett from Shirley Brereton and Carol Warner on 733/4. Winner - Lyn Solness (24) with a great score of nett 67. Wasn't it wonderful to have a cool day for a change! 31 players including two visitors enjoyed the course looking its best. 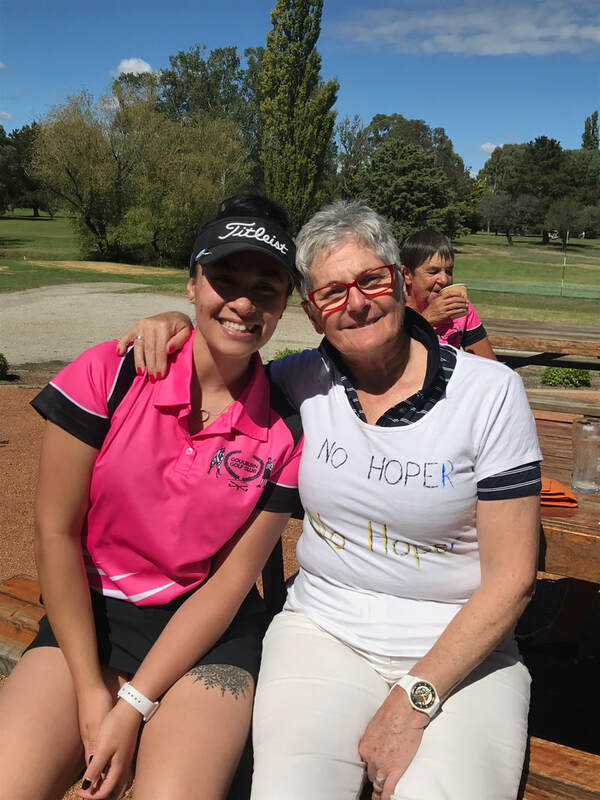 We welcomed our Handicap Manager Noela McMurray back to golf after almost 12 months. As you can see from the results her game has not suffered from the break. Now that Noela is back she was able to make the presentation to the winners of the Saturday Cup for 2018. This event is based on points awarded for each of the stroke rounds played during the year. For the first time ever this was a three-way tie between Maggie McKenzie, Pam Barker and Sue Harrison. This week the annual Women's Summer Meeting was held in the Highlands. 80 plus mainly visitors to the area played at Bowral on Monday and Mt Broughton on Tuesday. Foursomes and Team events were played at Highlands on Wednesday and Thursday. Golf NSW has stepped away from the event and this year it was managed by Tegan Purcell, the professional at Highlands Golf Club. 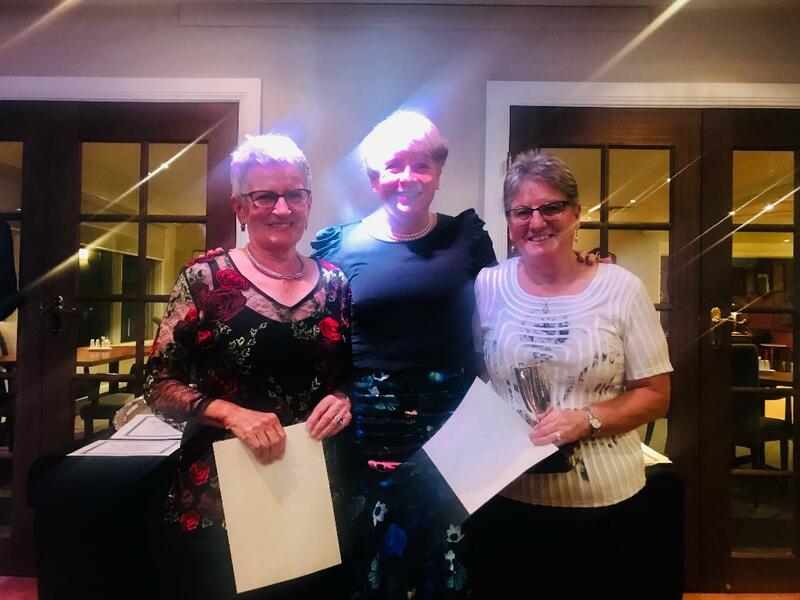 Pam Barker was the most successful of the Bowral players and was the nett runner-up for Division 1 on Monday with a nett 75. Well done Pam. Pam was unable to make the presentation on Tuesday night but I was able to present her with her prize on Thursday. 13 players braved the hot weather. Pro-pin - ($45.00) - not won so will jackpot to next Tuesday. Ellen Neale (23) won with a nett 72 from Pam Barker (19) and Pat Donohue (36) both with nett 75. Well done for the good scoring. Don't forget Invitation Day is fast approaching. Please put your details (and those of your visitors) on the sheet in the locker room. We will allocate tees for the shot-gun start on Thursday after golf. I have sent details to Goulburn, Moss Vale and Highlands Golf Clubs and if we get any takers we will team them up with our local players for this fun day. Today we completed the draw for this year's Challenge Bowl event. The draw is now on the notice board in the locker room. Could the first player listed in each match please take responsibility for arranging your game. Remember - matches must not be played on Thursdays. The first round needs to be completed by Sunday 14 April. A field of 22 players played and achieved some great scores. Only two players today with Maggie McKenzie (20) winning with 28 points. Pam Barker and I joined 130 other players at Belconnen Golf Club for the CSGA Opening Day for 2019. Pam represented Bowral in the Champion of Champions and Diabetes Trophy events but unfortunately could not bring home any of the silverware. I was more fortunate winning the Division 3 gross event with a score of 102. I also won a prize in the raffle. As Pam said - well worth the drive. This year's event will be held in the Southern Highlands next week. Approximately 80 players will be at Bowral on Monday and Mt Broughton on Tuesday. The Foursomes and Team events on Wednesday and Thursday are at Highlands. Only 3 Bowral members have entered this year but Pam Barker, Chris Hill and I will hopefully put our club on the results board. Two changes to note in your diary - remember always check events on the online calendar as the fixtures book may be out of date. A couple of changes to Saturday formats to align with the men's events being played. Saturday 11 May - Now a Foursomes event instead of Stableford. Fourteen teams (28 players) enjoyed a relatively cool day - just perfect for golf. The fog was so thick when we hit off you could not see the creek on the first. It seems a long time since we had a day like this. Eight teams (who wanted to qualify) now go on to the match play rounds over the next few weeks. The first round must be completed by Sunday 14 April - no playoffs allowed on Thursdays. The deadlines for the second round and final are 19 May and 23 June respectively. 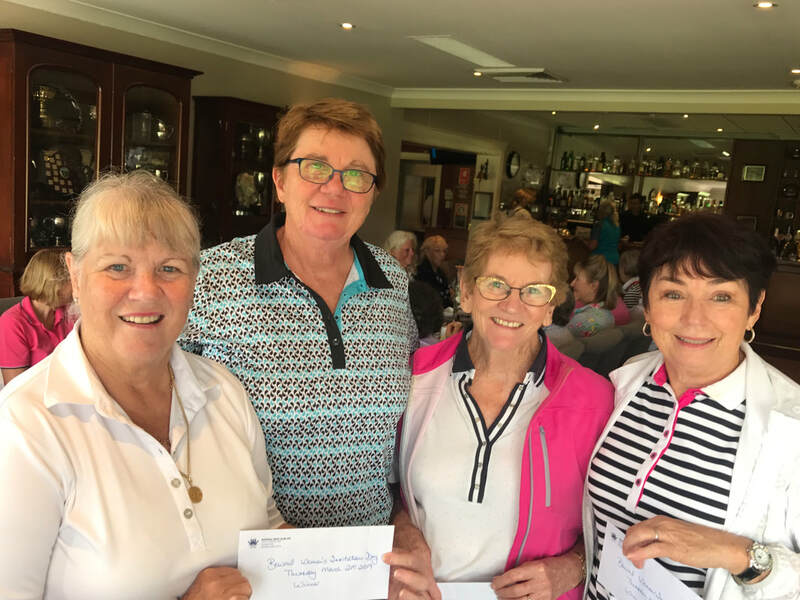 Four of our members Pam Barker, Helen Chadwick, Chris Hill & Jane Clifford travelled to Goulburn Golf Club joining almost 80 other players to participate in their open day. The weather was nice and cool and the morning tea as fabulous as ever. Helen Chadwick was our star of the day - runner-up in division 2 with a nett 69. Well done Helen - to think you nearly didn't go! Pam won a ball in the ball run down, while Chris and I just made up the field. 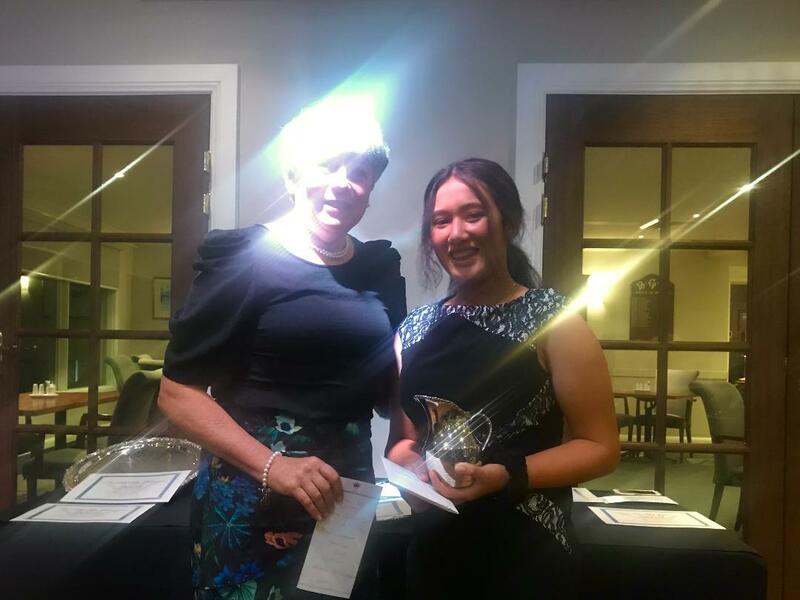 Here is a photo of Helen receiving her prize from Goulburn GC President Annie Gilmore. 31 players today so we were able to award prizes in two divisions. Twelve players today - great to see we are getting some good fields on Saturdays. There is no competition this Tuesday (26 February) following the greens renovation but feel free to come along and play. 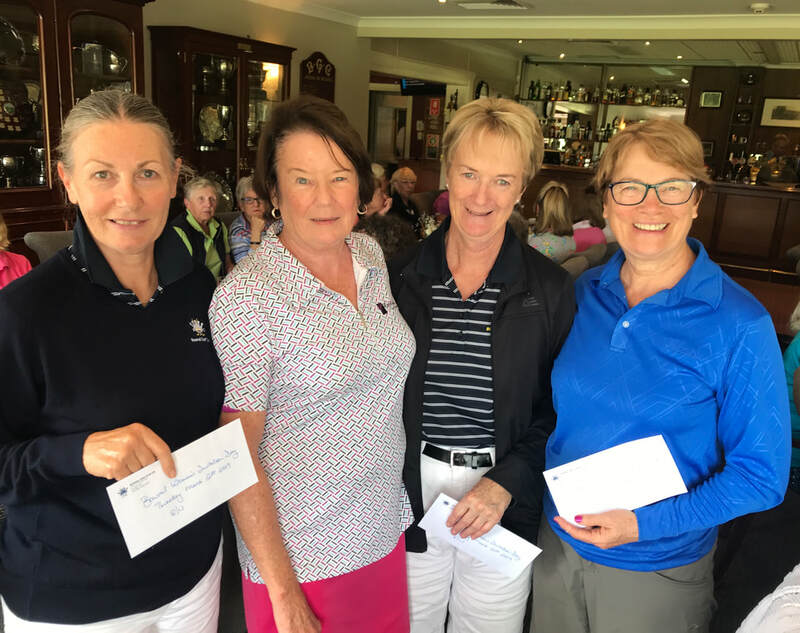 Pam Barker and Jane Clifford are travelling to Belconnen next Thursday to play in the CSGA Opening Day. In particular we want to wish Pam good luck. As our Club Champion Pam is playing at the front of the field in the Champion of Champions event. She is also Bowral's representative playing for the Diabetes Trophy. On top of all this there are her special duties as President of the CSGA. What a day! Our first medal round for the year was played under ideal conditions. Thanks to Damian and his team the course was a picture. 25 players competed across 3 divisions - unfortunately we seem to have had a few cancellations on the day - maybe we will have more next month. The two tee start worked well with the majority of players staying for lunch and the presentations. The winners of Club Medals are eligible to compete for the Medal of Medals later in the year. Winner - Carol Warner (20) nett 75 on countback from Maggie McKenzie. The medal is not awarded on a countback basis so this will now depend on the results from the next medal round on 28 March. 28 players hit the course for this fun game. As both players hit off there is much less pressure than straight foursomes. NTP 2nd shot 15th - Sue Harrison. This event will be played at Queanbeyan from 7-10 March. It is a fantastic opportunity to see some top women golfers in action. Visit the Golf NSW website and click on the link to get your free tickets for all four days.